The West Highland White Terrier’s ancestors come from Scotland, and they were originally used for killing vermin and hunting badger, fox, and otter. Many believe that the breed can be traced back to a tragic 19th century hunting accident. While hunting fox, Colonel Malcom of Poltalloch shot one of his beloved wheatencolored Cairn Terriers that he had mistakenly thought was a fox. He was so upset by it that he was determined to only breed white dogs so they couldn’t be confused with foxes. The West Highland White Terrier has been known by many names, including the Poltalloch Terrier and the Roseneath Terrier. They were officially recognized by The Kennel Club of England as the West Highland White Terrier in 1906. 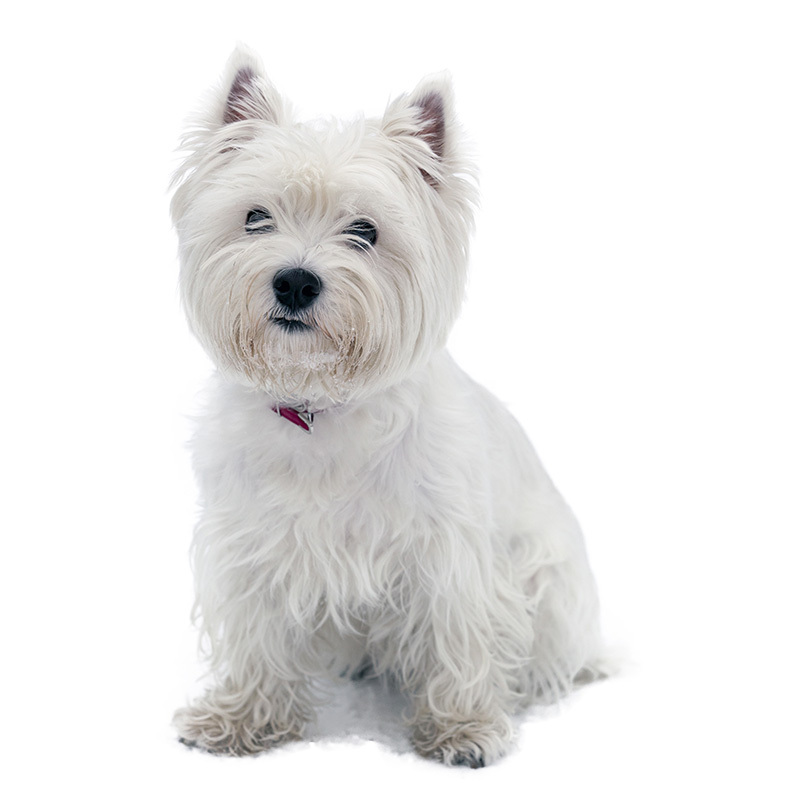 Westies (as they are affectionately called) are very friendly little dogs and get along well with everyone. They love being part of the family. They are funloving, confident, and find joy in almost everything they do. Westies have the classic terrier temperament of being active, spunky, energetic and confident. They’re a “big dog in a small dog body.” Westies are very intelligent and need to be kept stimulated in order to stay out of trouble. Taking daily walks is very important for this little energetic dog because he prefers to either run around having fun or run around getting into trouble! West Highland White Terriers usually weigh between 15 to 22 pounds and stand approximately 10 to 11 inches tall. They are sturdy and stocky and have short legs. They have a double coat which is thick and white. Their coat is easy to groom and requires regular brushing. Westies are low shedders. The West Highland White Terrier is the 21st most popular dog registered with America's Pet Registry Inc. Also, America's Pet Registry Inc.’s mascot is a Westie named Hero. He is so photogenic and looks like he’s smiling at everyone.